Thinking back on my childhood, it differs so much to how my children’s is panning out. Not in a bad way; it’s far from it that I had a bad childhood, it’s more so in the way the world and its inclusion of technology is evolving. When I was as old as my children are now – we’re talking 25 years ago (I know it’s not that long ago, but it feels like it!) – there wasn’t the technology available in the abundance that there is nowadays. With more and more parents working longer hours to be able to provide their children with the childhood they never had (54%, in a survey conducted by MyVoucherCodes), there are more and more children using technology in order to entertain themselves. I’m in a similar mindset as Working Mother; technology can be a good thing if utilised correctly. I believe that technology should be limited and most learning and exploration should be done without the use of technology; be it out in the natural environment, through arts & crafts, or through good old fashioned books (though I read a lot myself on an electronic device!). I will hold my hands up and say I have been the bad technology mother at times, in times of desperation when I have used it as a virtual babysitter; but technology can be useful in learning also. I see children out and about in pub restaurants and such, using tablets to keep them entertained. Don’t get me wrong, I have been guilty of this myself but my children can get very rowdy and I try to only use it as a last resort. 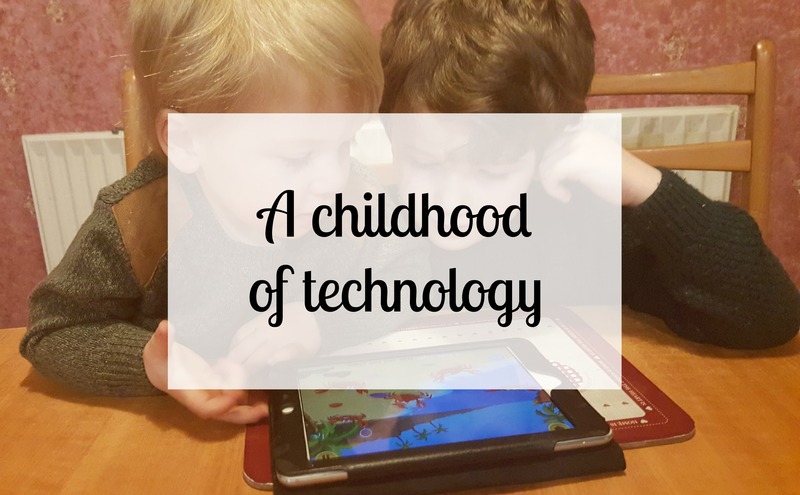 There are a lot of educational apps about nowadays though, and the boys love watching nursery rhymes and learning videos such as vehicles and colours on their tablets. They don’t use them every day, and when they do it’s usually for no more than hour; mainly because they get bored and do want to be hands on doing something. My boys do love television but by no means do they spend all day watching it. Quite often it will actually just be background noise as they have found something else to occupy themselves with, and I am otherwise occupied so have forgotten to turn it off. A lot of the programmes they do watch are educational though, for example – they can learn to sign, they can learn direction, they can learn shapes. Children using mobile phones are also becoming younger and younger nowadays. I see no need for a child to have a mobile phone, until they know how to call somebody on it. I can see the need for them as teens, for parents to keep in contact when they become independent. But much before that? Not at all. I guess you could argue this point with the tablets above, but in my opinion, their main uses are two different things. I don’t believe my children are having the childhood I had, and maybe it’s the same for other parents. There just wasn’t the technology available to me then, that they have now. I can name a handful of series that I watched on television; a tablet was unheard of – I had my first computer aged 11 or so; my first mobile phone was around the age of 12. Prior to that, I would always be outside. I really believe that nowadays, parents should be in charge of a child’s technology and not the the child controlling the technology; they should encourage them to explore the world naturally, not artificially. There is so much more to be gained from exploring outside, than sat inside in front of a screen. I wouldn’t judge a parent on their use of technology with their children though – I’m certainly no angel! Do you believe your children are having a different childhood to yours due to the amount of technology available nowadays? Or do you greatly limit the amount available to them?